Fantasies about new power sources for human ambitions go back a century or more. Could these past visions energise our own future? is professor of history at Aberystwyth University in Wales. He is the editor of The Oxford Illustrated History of Science (2017), and his biography of the inventor of the fuel cell, William Robert Grove, is forthcoming. In his short story ‘Let There Be Light’, the science-fiction author Robert A Heinlein introduced the energy source that would power his Future History series of stories and novels. First published in Super Science Stories magazine in May 1940, it described the Douglas-Martin sunpower screens that would provide (almost) free and inexhaustible energy to fuel the future in subsequent instalments of his alternative timeline. It was simple, robust and reliable technology. ‘We can bank ’em in series to get any required voltage; we can bank in parallel to get any required current, and the power is absolutely free, except for the installation costs,’ marvelled one of the inventors as they worked out the new technology’s potential for rupturing the social order of the future. 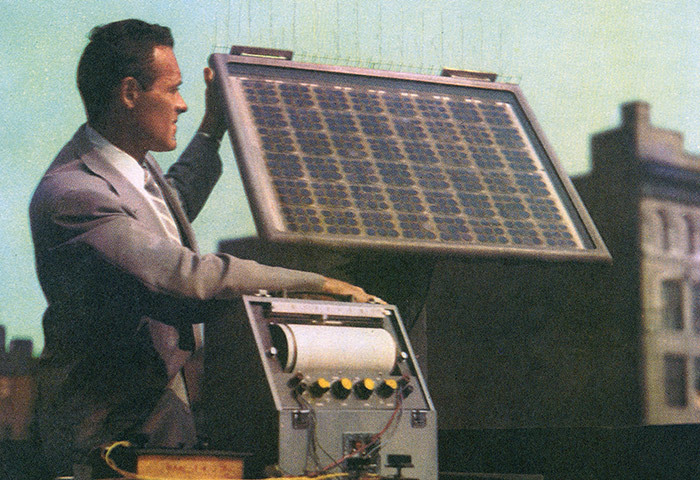 The sunpower screens were clay-coated panels that absorbed sunlight and turned it into electricity with almost 100 per cent efficiency, or worked the other way to turn electricity into light. Like most of Heinlein’s Future History stories, this one offered readers a calculated blend of technology and culture. The sunscreens weren’t technology from nowhere – they fitted into a particularly American history of invention that emphasised individual ingenuity against corporate and collective power: in the popular imagination, they were the descendants of Thomas Edison and Nikola Tesla. The story was stamped with Heinlein’s own distinctive brand of anti-corporate politics that emphasised individuals’ responsibility for making their own futures. Heinlein’s story is a good example. 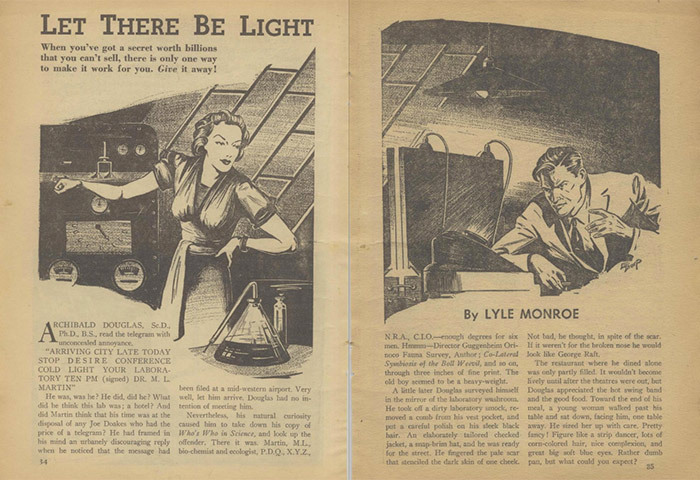 The technology described in ‘Let There Be Light’ had its counterpart in the real world. The way exposure to light changed the electrical properties of selenium was noted by the telegraph engineer Willoughby Smith in 1873, and a few years later William Grylls Adams and Richard Evans Day managed to generate electricity by shining light on selenium arrays. But as early as 1833, the inventor Charles Fritts installed an array of solar cells made of selenium coated with a thin layer of gold on a New York rooftop. These were the technologies from which Heinlein’s vision of future energy took imaginative flight. Intriguingly, the file of materials in the Heinlein archives pertaining to the story contain a newspaper clipping from 1954, describing the newly invented Bell solar battery, headlined ‘A Sunshine-Sand Battery Produces Power’. Did Heinlein see his fictional technology as the precursor of that real one? Heat, Light, Electricity, Magnetism, Chemical Affinity, and Motion, are all Correlative, or have a reciprocal dependence. That neither taken abstractedly can be said to be the essential or proximate cause of the others, but that either may, as a force, produce or be convertible into the other, this heat may mediately or immediately produce electricity, electricity may produce heat; and so of the rest. That was exactly what the sunscreens did. Explaining correlation, Grove offered an experimental demonstration of his own that involved using light to generate electricity, building on the experiments of the physicist Edmond Becquerel a few years earlier. Still, the fantasy of a future powered by cheap and inexhaustible electrical energy was common throughout the Victorian period. In his utopian/dystopian account of a subterranean civilisation in The Coming Race (1871), Edward Bulwer Lytton was clear that the Vril-ya’s technologies were powered by electricity. The Vril-ya lived in a world in which electricity (or vril, as they called it) powered everything. Electricity ran their machinery, controlled the weather, and helped to grow crops. It was the source of their telepathic power, too. Such speculations worked for Bulwer Lytton’s readers precisely because they mirrored the futuristic speculations made in the real Victorian world. The prediction that electricity would soon supersede steam as the universal source of economic power was ubiquitous. Grove shared that optimism, even as he poured economic cold water over its imminent prospect. When the British Association for the Advancement of Science met in Grove’s home town of Swansea in 1848, the visitors were taken to his friend John Dillwyn Llewelyn’s palatial estate in Penllergaer to see a boat powered by a bank of Grove’s nitric acid batteries puttering about on the lake. While our concerns about future energy are now primarily dictated by encroaching climate change, Victorians worried more about the need to ensure that future energy would belong to Empire: future energy in the wrong hands and its consequences was a favourite topic of fin-de-siècle scientific romance. In his novel The Outlaws of the Air (1895), George Griffith imagined rival anarchist groups (utopian and nihilist respectively) slugging it out upon the sea and in the air with electrical gunboats and airships wielding electrical weapons. In The Angel of the Revolution (1893), Griffith pictured revolutionary anarchists with access to a new source of energy in control of the air and terrorising the great European states into submission. In both stories, the social organisation of the future was going to depend on who owned the right kind of power. The realisation that controlling future energy was essential to maintaining (or subverting) the social order was what made stories about that energy falling under alien control simultaneously so terrifying and so alluring. These fictional speculations were mirrored by inventors and entrepreneurs. Indeed, projection was part of the process of invention. Much of Tesla’s reputation at the height of his career depended on his ability to invoke futures for his plans for energy production and transmission. In the 1890s, while working with George Westinghouse to win the contract to provide electricity for the Chicago Columbian Exposition (we might almost think of that as providing energy for the future) and develop hydroelectricity from Niagara Falls, Tesla was fantasising about turning the planet into a machine for transmitting electrical power. ‘I do firmly believe that it is practicable to disturb by means of powerful machines the electrostatic condition of the Earth, and thus transmit intelligible signals or perhaps power,’ he argued. Such speculation moved back and forth between fact and fiction. In ‘Some Possibilities of Electricity’ (1892), for example, William Crookes built on the latest developments in physics to talk about electrical energy’s transformative prospects. He pictured a world where electrical energy grew crops and controlled the weather (had he read Bulwer Lytton?) and the ‘ideal way of lighting a room would be by creating a powerful, rapidly alternating electrostatic field, in which a vacuum tube could be moved and put anywhere, and lighted without being metallically connected to anything’. Inventors everywhere claimed inspiration from scientific romances whose authors mined the latest science for their imagined futures. It is an interaction that is still going on. X-rays and radioactivity promised future energy, too. Fresh on the heels of Wilhelm Röntgen’s discovery of X-rays in 1895, Edison filed a patent for a lightbulb powered by X-rays. The radioactivity researcher Frederick Soddy in 1909 marvelled that ‘there is imprisoned in ordinary common matter vast stores of energy, which ignorance alone at the present time prevents us from using for the purposes of life’. Cracking the secret of radioactivity would mean that the ‘struggle for existence’ that characterised modern culture would be remembered by the future as ‘but a passing phase’. Such speculations fuelled the boys’ own adventure yarn The Radium Casket (1926) by Lawrence Bourne and its sequel Radium Island (1936), in which clean-cut Englishmen battled foreign hordes for control of the future’s fuel. Working out just how the future will work still depends on this interplay between fact and fiction. Not just because, today, clear lines of connection link contemporary debates with their Victorian and Edwardian antecedents – though these are often forgotten in contemporary discussions of figuring out the future. But it turns out that fictionalising the future can be an effective way of realising it and making it familiar. When commentators and entrepreneurs debate future worlds in which power is generated by solar panels, fuel cells, wind farms or fusion, their imagined futures make sense to us largely because they seem familiar. And they seem familiar because we already know about other fictional futures that work like that – and, though this might seem less clear to us, because ours is a culture with a history of thinking like that about the future. Put another way, our fictions offer a means of fixing the future’s energy technologies in the form of cultural expectations. Heinlein’s alternative futures effectively run scenarios of how different energy technologies might be played out, giving energy futurologists a playing field where they can work out what the social worlds of different future fuels might be. As the science-fiction writer Cory Doctorow put it in 2014: ‘There is nothing weird about a company doing this – commissioning a story about people using a technology to decide if the technology is worth following through on. It’s like an architect creating a virtual fly-through of a building.’ Generating future scenarios both factual and fictional is increasingly part of the world of future energy management. In this process, the boundary between fictional and factual worlds of energy becomes fluid in a number of interesting ways. Just as it did for Victorian speculators. Two shared elements underline this seamless continuity between how we imagine the future and its energies now, and the past visions of the Victorians. Like them, we tend to see energy innovation as the work of individuals rather than collectives. And like their Victorian predecessors, our energy innovators consciously deploy imagined futures as a strategy for making their technologies real. Heinlein’s fictional Douglas-Martin sunscreens were the invention of two mavericks (one of them female) who sit outside of, and are threatened by, corporate structures. Even in the Future History short story in which spaceflight is invented – ‘The Man Who Sold the Moon’ (1951) – D D Harriman, the protagonist and an advocate of space travel, is presented as a maverick outsider, notwithstanding his corporate creds. It is tempting to speculate to what extent Elon Musk models himself on Heinlein’s Harriman, whose opening line in the story was: ‘You’ve got to be a believer!’ The model for Harriman, in turn, was Edison, who perfected the act of looking like an individual, rather than the corporate head he actually was. Victorian historians of innovation such as Samuel Smiles – the author of Self-Help (1859) – turned innovators into embodiments of virtuous and disciplined self-improvement. Consider James Watt, for example. The steam engine, by Smiles’s account, was less the product of individual genius than of individual character. Watt succeeded in developing the engine that would power the future not because he was a genius but simply because he kept on trying. Or maybe, more accurately, his genius was his perseverance. There were other models of individual future-makers available, too. Edison and his boosters promoted an image of him as the Wizard of Menlo Park (after the New Jersey lab that Edison founded in the 1870s), a man outside his age, possessing unique insights into how the road to future energy might be negotiated. This view of inventors as somehow already inhabiting their own future (Leonardo da Vinci offers another example) reinforces our sense of them as otherworldly outsiders. Critically, changing perceptions of how the energy of the future will be generated entails changing the ways in which energy’s past is written. Grove and the fuel cell is a good example. Until quite recently, Grove was an almost entirely obscure figure in the history of Victorian science, his gas battery a forgotten technological curiosity. Yet his current reinvention as the father of the fuel cell and the rediscovery of the gas battery as the precursor of our hydrogen economy will mean rewriting the history of Victorian energy technology, too. It is almost tempting to imagine a future in which Grove will have replaced Watt as the icon of Victorian energy. Growing numbers of fuel-cell entrepreneurs are starting the process already, easing their energy technology’s way into the future by giving it the right kind of past. Indeed, it sometimes seems as if finding the right kind of history for new energy technologies is an essential part of the process of finding them a future. The rewriting of Grove is one example. Tesla’s place in Musk’s future-making is another. Tesla himself clearly understood that telling compelling tales about his visions of new energy futures – setting out where they came from and where they were going – was central to their promotion. Coming up with stories about his inventions’ future was part of the process of realising them. Musk, too, appreciates that finding compelling narratives about the future matters to his project: he understands that giving his future a history (hence Tesla the company, and the car) is a necessary part of getting there. The recent launch by SpaceX of a Falcon Heavy rocket carrying a Tesla roadster into space on an orbit heading towards Mars is another instance of Musk’s ability to meld scenes from fictional and factual futures to promote his vision. When I saw those images, I am sure I was not the only one reminded of a scene from the TV series Star Trek: Voyager (1995-2001), in which the crew encounters a pickup truck floating in space. Musk’s plans to colonise Mars likewise draw on imagery and desires derived from science fiction, while the Tesla electric car appeals by putting clean energy technology into a vehicle designed to invoke dreams of a sci-fi-styled future. Musk is very good at offering plausible technological roads to fantastic futures. He is not the only contemporary future-maker to do this. Bill Gates’s calls for humans to invent their way out of the problems of encroaching climate change draws on a similar appeal to an imagined future of limitless clean energy. Such future-building carries conviction on the back of a long history of invoking the power of technological innovation to literally transform worlds – as in Kim Stanley Robinson’s Mars trilogy (1992-96), for example. The same might be said of current speculation about how geoengineering might provide answers to the problems of climate change. Today, the solar power that fuelled Heinlein’s speculations in ‘Let There Be Light’ is big business. Its prophet-entrepreneurs might not elicit the instant recognition of Musk and Gates, but they tell the same sorts of stories to link their technologies to the future. The leading company First Solar traces its origins back to the inventor Harold McMaster, who stuck stubbornly to his single-minded vision of a future powered by solar energy, despite setbacks. It’s another instance of our valorising individual ingenuity. We have been imagining the future of energy and the worlds it will generate for more than two centuries, and the cross-fertilisation between inventors and their literary counterparts continues to shape our imaginings, more often than not by invoking a pervasive individualism. It’s as if we struggle to get away from the notion that energy technologies have a single origin point and so these origins have to be located in specific individuals. Such individualism is often accompanied by the suggestion that only one fuel, be it hydrogen, wind or solar power, will dominate our futures, real or imaginary. Just as coal and steam powered the 19th century, or oil and electricity the 20th century, our stories about future fuels assume that one principal form of energy – solar, wind, nuclear – will monopolise the future. too. If we want to overcome these imaginative limitations, we need to rethink the sorts of stories and histories we tell about energy, its origins, and its cultures. Though we’re conditioned to see energy revolutions coming about through individual rather than community action, the danger of this narrative – seductive and potentially useful as it is – is that it presents the future and its energies as belonging to someone else. To overcome that, we need to recognise that the expertise needed to make sure that the future is powered how we want is collective. As the cyberpunk writer William Gibson put it in the 1990s: ‘The future is already here – it’s just not very evenly distributed.’ Gibson’s comment matters because it underlines the ways in which the ingredients from which futures are made are always, already, parts of our present and our past. If access to those ingredients is unevenly distributed now, then the futures made out of them will be just as problematic. This is why, when it comes to the energy that will make the future work, it’s vital that we get our histories right. Promoters of future energy regimes such as Musk weave stories that compel because they seem familiar – they have a singular history. If we want to make sure that those future energy regimes address all our interests, it’s important that the stories that get told, and the routes they map out to get us to those futures, include everyone in the process. In short, we need to change the history of the future.